Easter is probably one of the best times for someone to visit Greece as he will have the opportunity to be a witness of this family oriented festivity with all the traditions and local cuisine that accompany it and also admire the mother nature with its’ beautiful colors and smells during spring. Easter in Greece on a sailing boat is an alternative way to feel this unique atmosphere and participate, for at least these few days, to the celebrations which are lively and loud all over the country. Your skipper will be, as always, at your disposal to inform you about local customs, guide you to magnificent churches and to monasteries with amazing view and, of course, answer any potential questions that you may have. Above all, Easter is an integral part of Greek culture so, it’s worth taking the most out of your visit during this period. Weather is generally mild in broader Athens and Saronic Gulf area with temperatures varying from 11.6 C˚ to 20.3 C˚ and water temperature from 17 to 19 C˚. However, since our number one consideration in Diaplous Yachting is always your safety and comfort, we realize that, sometimes during this period of the year, weather may affect your trip (due to high seas or heavy and continuous rain). In this case we will adjust our sailing route accordingly and will do our best to mitigate this adversity as much as we can. In extreme weather comnditions (which is indeed very rare), we will even offer a discount to the agreed charter price as a gesture of good will towards you. 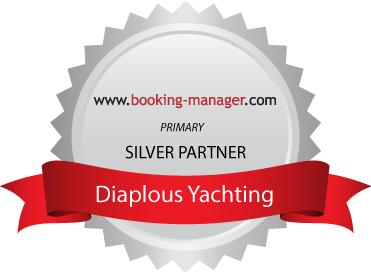 You see, in Diaplous Yachting we want to make you really happy in order to come back next year and also talk to your friends about this exciting sailing experience in Greece. Below, you can see an indicative one week sailing itinerary that we propose starting on Tuesday April 11th to Tuesday April 18th although we are flexible to discuss dates of departure and return according to your preferences including the case of a charter of longer duration. Holy Thursday is a day of baking “Koulourakia”, the special Easter biscuits and dyeing of dozens of boiled eggs bright red to symbolize the blood of Christ and the renewal of life. Leonidio recaptures one of the most phantasmagorical Easter customs of Greece, the flying of the hot-air balloons. When we say "Christos Anesti" (Jesus has risen) on Holy Saturday, the gluing from the hot-air balloons which are soaked with oil and petrol are set on fire makeing them to rise up in the sky and the stars. On Spetses, as well as on other Greek islands, Easter takes on fascinating aspect with the fireworks going off around on the "Resurrection" night next to the deeply religious atmosphere, in all Churches.